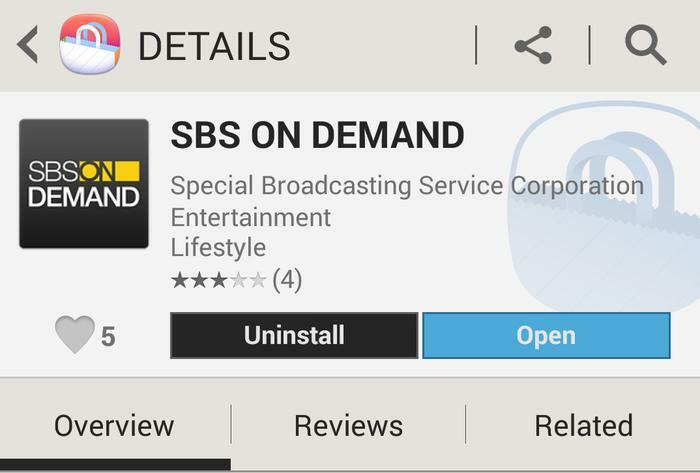 The SBS On Demand app is now available in the Samsung Apps Store. It was previously available on the Apple iOS App Store, the Microsoft Windows Phone Marketplace, and Windows Stores, as well as Sony's PlayStation 3 and Microsoft's Xbox 360 gaming consoles, and a range selected smart TVs. The On Demand app will work with Android devices running Android 4.0 and above (Ice Cream Sandwich and Jelly Bean) but will initially be exclusive to Samsung devices for three months. It is currently available to download through the Samsung Apps Store. An SBS spokesperson told Good Gear Guide that the roll-out to other devices "will begin from that point onwards", but the network hasn't committed to a firm launch date in the Google Play Store. SBS chief digital officer, Marshall Heald, said the availability of On Demand for Android means SBS has a catch-up viewing service available on more platforms than any other Australian broadcaster. "This launch really cements SBS's position as a leader in the online space, with On Demand available across more platforms than that of any other broadcaster." "This launch follows extensive device testing, in the first phase of a roll-out across Android devices. SBS On Demand will be progressively available on other Android handsets." "SBS On Demand already attracts over five million views per month. This latest move to Android devices, starting with Samsung, is only going to help boost those numbers, allowing SBS to reach the growing audience of Australians who are hungry for great content on the go." The On Demand app for Android allows users to search and browse videos in a number of categories, including feature films, news & sport, documentaries, and food shows. Other features include a program subscription tool, the ability to create custom playlist, and push notifications that will alert viewers when new videos have been added, or when a video is about to expire. SBS says the On Demand app features adaptive video quality, meaning videos automatically adjust to available bandwidth and network conditions. However, all On-Demand content is metered, regardless of the users' carrier.